The days of triple digit heat are an exercise in endurance. Suddenly, nothing means anything, so long as you survive the day. Dishes can be unwashed and children un-bathed, as long as you stay hydrated and skip heat stroke. I hose the kids off before bed sometimes, and sometimes I let them sleep in their undies, dirty toenails sticking out from their sheets…who am I kidding, I never put sheets on their bed. On 100 degree days I’m a portrait of survival. Usually though, I try to hide behind a semblance of soap and appearances. Not when I’m sweating though, then I call it good if no one is bleeding or broken at the end of the day. Here we are, 7:30 p.m. and we’re alive, some of us with more chocolate cake in our neck folds than others. It’s June. It’s my baby’s birthday and now he is TWO and we have survived. Bedtime has come. We sang him “Happy Birthday” at 6:30 a.m., and many times after that. I did it just to see him hide his smiling face behind clenched fists. We had pancakes and chocolate milk for breakfast. We went to the farm and held “bebe ticks” which, thank the Lord, are actually “baby chicks”. We dug up potatoes from the dirt and ate blackberries from the vine, and small people got “tuck in mud” while bigger people picked peaches. I also got stuck in the mud, but I kicked off my flip flops and wiped my feet in the grass. We went swimming. Tobin is a bottom fish, a halibut of the finest degree. He would jump into the water and sink gracefully, smiling as we fished him to the surface. We rescued a frog AND a toad from a watery, chlorinated grave. We found a dead mouse and Shel (unfortunately) carried it around in excitement before we took the time to actually LOOK at what he had found. We talked about how sad it was that the mouse had died (not very). Some people became indignant at our lack of rodent sympathy on the very day of the funeral and declared loyally that MICE are their FAVORITE animal. We went out for Mexican food with my 90 year old Aunt Jeanne and my Mother, who’s birthday is also today and who seemed a little shell shocked by the four boys I took with us to lunch. I had four because I was watching my nephew as well as my own. My nephew tried to kill me by wearing his sneakers untied. He had to go to the bathroom at the restaurant and he kept losing a shoe along the way. You have no idea how close I came to throwing two size 10’s into a vat of refried beans. We drove home and watched a movie, because there is only so much I can take. We had more cousins over and Derrick bought a cake the size of Alaska for the party. The cake caused me to spiral into anxiety, which is normal. I’m a very anxious person, and when I’m presented with a cake from a warehouse store that’s intended to feed 60 adults, I freak out a little. I don’t have the same standards for myself. When I realized I didn’t have any candles, I philosophically used the only one I could find. It was a glittering, glamorous, orange number 3 candle. For Tobin’s second birthday. Derrick smelled prejudice and we had a Civil Rights movement in our kitchen for men who buy enormous cakes. Ordinarily I would write a sentimental post on the wonderment of being a mother of a particular boy. Take my word for it, I’m full of wonderment. Tobin is fantastic and amazing. After a particularly thrilling day of chasing him around the house and fishing him out of danger, I realized that he is 007. I have given birth to a tiny James Bond, and…I have survived. Happy Birthday Tobin. You are loved beyond irresponsible cake purchases and inaccurate candles. You are loved. You. Are. Loved. I love this post SO much! “I don't have the same standards for myself. When I realized I didn't have any candles, I philosophically used the only one I could find. It was a glittering, glamorous, orange number 3 candle. For Tobin's second birthday.” So fabulous. I had such fun reading this. What a wonderful time of celebration! Happy birthday to you little man. Two? Wow. You made me smile on this day when we will move our boy to his new home to begin his next phase of life. I remember the days of two with him, the almost 22-year-old. I keep them treasured in my heart. Cheers to birthdays and baby ticks! This is so sweet. I became a mother 25 years ago on June 7th…a delicate, dainty little thing who is still the most gentle soul I know. I'm glad the world has James Bonds and Tiny Dancers both today. Happy Birthday to your 007! By the time I got to the end of this I found myself saying, “THIS is why we are bloggy-friends.” We rushed a cupcake on the way to church for C's fourth birthday. No candle. No party. It was still a happy day. 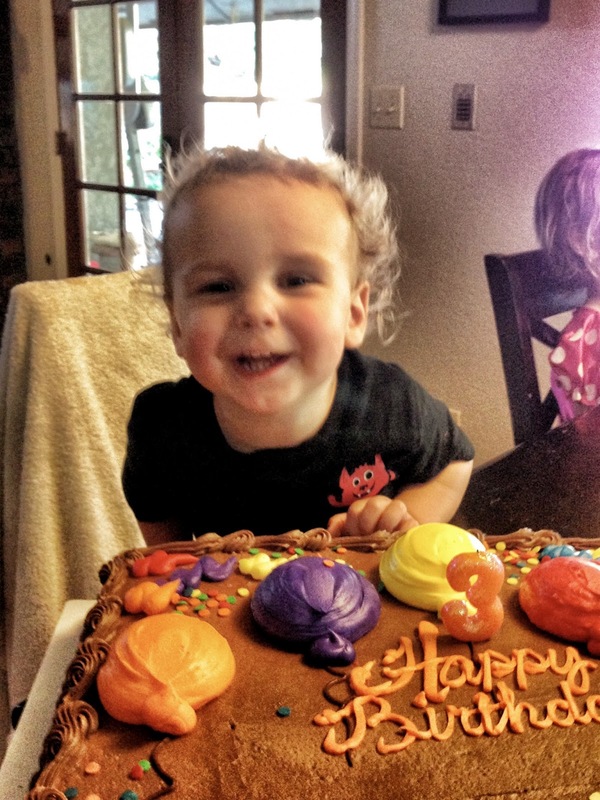 Can't believe your littlest is TWO! Happy birthday, Tobin. Yes he is: look at that face! Also, you are one of the bravest people I know. 007 is one lucky boy. Oh, I roll like you. I'm with Amanda – THIS is why we're friends!! “Here we are, 7:30 p.m. and we're alive, some of us with more chocolate cake in our neck folds than others.” Favorite EVER. I think a number three candle for a two-year-old's birthday is quite suitable because we always put on an extra candle “to grow on”! Which causes problems years later when trying to decide which birthday it is in the photo…so I count the candles and subtract one for the actual age of the birthday child. Is this smart?